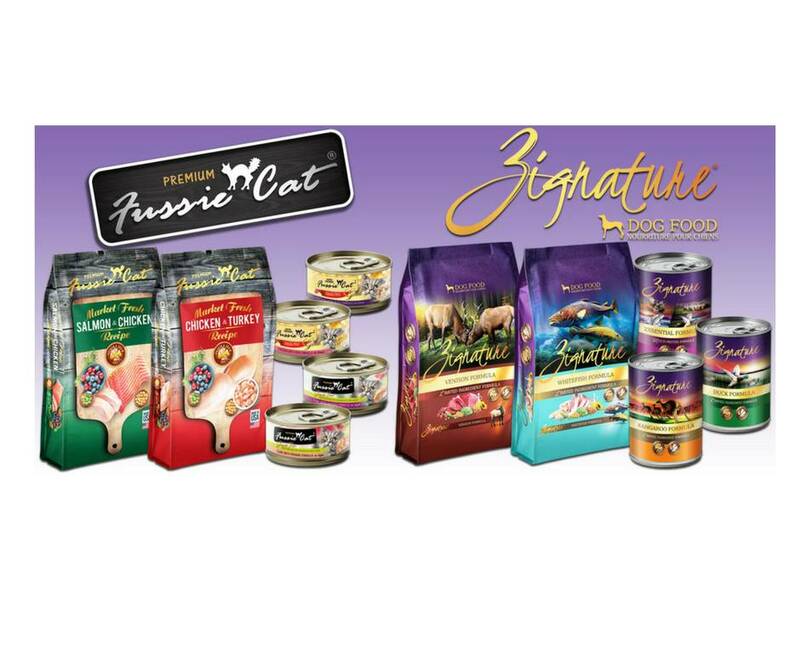 Fussie Cat and Zignature pet foods, something special for your cat and your dog! Cats are designed to process meat efficiently, so roughly 20 percent of your cat's diet should be from animal-sourced protein. And as strict carnivores, cats do not thrive on a diet high in carbohydrates, so canned foot should only contain three to five percent carbohydrates. Felines are also designed to obtain most of their water through their diet as 70 percent of their normal prey is made up of water. So feeding your feline foods with a high water content helps support their hydration. Once you take all of that into consideration, and just as importantly make certain it pleases the palate of the most discriminating feline, you have Fussie Cat cat food! Dogs are carnivores. They need a diet rich in animal protein to help build silky coats, healthy muscles, and strong bones. That is why Zignature dog foods are first and foremost made from quality meat or fish. It's not only what your dog craves, but what they need to be healthy. By limiting the number of ingredients in their recipes, Zignature foods help ensure proper digestion, while minimizing allergens and food sensitivities. Meat first provides your dog with the animal protein they need, while eliminating corn, wheat, soy, and potatoes. Supplements are also an important part of the recipes—antioxidants, essential fatty acids, and a complete selection of vitamins and minerals creates a food that becomes your pet's signature recipe! Join us this Saturday from 12 - 3 p.m. to pick up free samples of Fussie Cat and Zignature along with Earthborn Holistic pet foods. And don't forget about Mystery Supplement Sundays from 12 - 5 p.m.